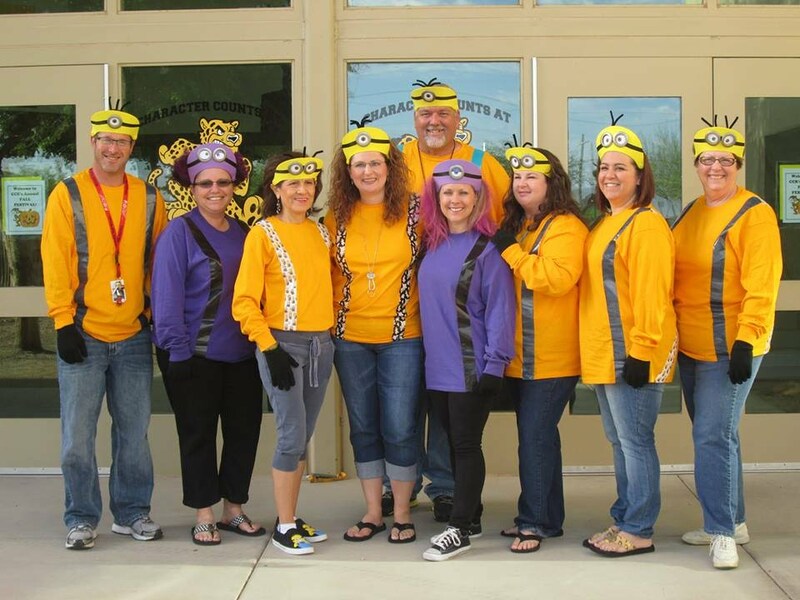 Our Office Staff is Worth a Minion!! Challenge: Students will build a machine that will Erase a chalkboard. The Cheetahs had the win with a score of 22-14. Great game all! Jake Morris was strong at the plate and on the rubber in carrying The Cheetahs to a 11-0 victory over Anthem on Monday. Morris went a perfect 4-4 at the plate for The Cheetahs. He singled in the first, second, third, and fifth innings. Anthem couldn't get anything going as long as Morris was on the hill. They managed just three hits off of Morris, who allowed no earned runs, walked none and struck out five during his five innings of work. “Hot Bats” include; Jake Morris with 4 hits. Bryson Schneider and Christian Celis both with 2 hits. Justin Houchard and Jovani Varela both with 1 hit each. Great Defense by Christian Celis at 2B, Dalton Holley at 1B, Adrien Parra in RF, Cameron Thomas at SS, and Justin Houchard in LF. Tucker Usher's RBI double triggered a comeback that would fall just short dropping a hard fought game to Copper Basin, 5 to 3. "Hot Bats" included; Jovani VARELA with 2 hits, Gage Quigley, Jake Morris, Tono Gallegos, and Tucker Usher each had 1 hit. Great Defense by Dalton Holley at 1B, turning the games only double play, Justin Houchard in CF, Jaden Mata in LF, Adrien Parra in RF, and Tono Gallegos on the mound. The Cheetahs built an early lead against Skyline Ranch, scoring 10 runs in the first inning, en route to a 12-7 win on Thursday. Jake Morris racked up three RBIs on two hits for The Cheetahs. The Cheetahs built upon its lead with two runs in the second. Cameron Thomas started the inning with a solo home run. Tucker Usher got the win, giving up 7 runs on 4 hits, 6 walks and 4 strikeouts. Great Defense By: Kahlil Cooper LF, Anthony Cox CF, Adrien Para RF, and Austin Bingham behind the plate. In Mr. Christ's math class Algebra students were learning dimensional analysis. 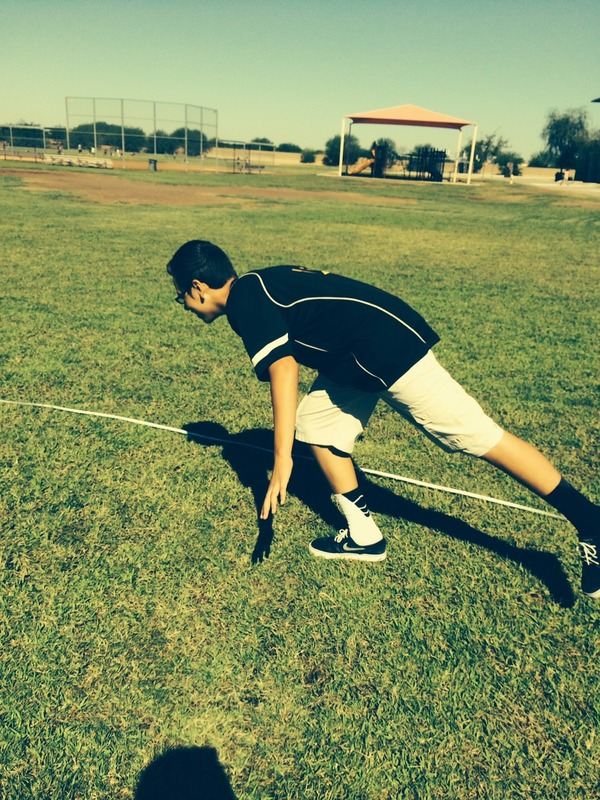 To experiment with this, students went out side and ran different distances using different units of measurements. After this, their goal was to convert them into a common unit of measure using dimensional analysis then compare the speeds of different kids in the class. Students then hypothesized that kids running a shorter distance were at a disadvantage because they had to accelerate and had less time at their top speed. Students then had to devise an experiment to prove or disprove this theory using dimensional analysis. 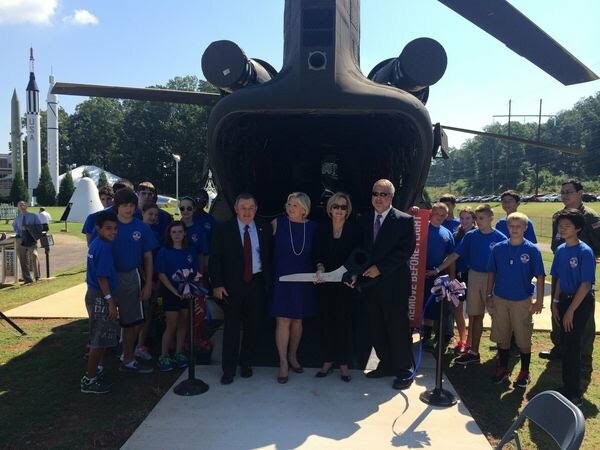 One of our 7th grade student, Ferdinand Virtudes, who is now at the US Space and Rocket Center in Huntsville, Alabama to avail of his one week full scholarship at the Space Academy has been privileged to be a part of the ribbon cutting ceremony along with distinguished officials and his fellow campers last August 27, 2014 on the Chinook helicopter, the newest outdoor exhibit at the U.S. Space & Rocket Center in Huntsville. The Chinook helicopter that served disaster, combat missions for 50 years is now officially on display at U.S. Space & Rocket Center in Huntsville. Each month teachers choose a student in their class who excels in portraying a given character trait. This month's character trait was Responsibility. Several students who showed outstanding responsibility with their classwork, homework, and school behavior were chosen to participate in the Ice Cream Party that was put on by Junior Student Council. Great responsibility Cheetahs! Coffee Cafe was busy, busy, busy with students, teachers, and parents! There was plenty of coffee, waters, and, best of all, DONUTS! Watch for announcements of the next Coffee Cafe Friday. Hope to see you there! Each week, Mr. Bravo's 5th graders join Mrs. Davis' 2nd graders to support their learning of reading. The 2nd graders read to the 5th graders; the 5th graders help the students with sounding out words and their fluency. Great teamwork! Cheetahs came out to enjoy a night of fun and free food Wednesday night at Florence Unified School District's Community IMPACT event! Robotics and STEM showed off their creations, entertaining loads of people all night long. All school mascots did a photo shoot and a dance off! The night was a blast! A proud moment was captured when this student of Ms. Hirsch's mastered this concept. Converting measurements is a difficult task, but he conquered this problem. Good job! Kinders create a Tree Trunk to finish up T week. It's a lot of hard work learning the alphabet. Great job Kinders! Mrs. Hendry loves to get into classrooms as much as possible. She enjoys observing and participating in classroom activities. Here she can be seen reading to a class of first graders on Friday afternoon. As you can see, the first graders are captivated by the story. Awesome listening 1st grade! Not even a strong hitting and pitching performance from Cameron Thomas could carry Cheetahs past Magma Ranch on Thursday as The Cheetahs suffered an 8-6 defeat. Thomas paced The Cheetahs at the plate. He went 3 for 4 and scored one run. He singled in the first, third, and sixth innings. He also held Magma Ranch hitless over 1 2/3 innings, allowed no earned runs, walked three and struck out five. "Hot Bats" included; Tucker Usher, Jake Morris, Gage Quigley and Jaden Mata, who all had 2 hits each. Great defensive efforts by Jovani Varela behind the plate, along with Christian Celis at 2nd, Dalton Holley at 1st and Antonio Gallegos at Pitcher and Short Stop. BT standard: I can perform measurements using appropriate scientific tools. Question: Why do we have to measure? Explanation: Measurement tools and skills have a variety of uses in everyday life. The ability to use measuring tools, rulers, thermometers, scales, and to estimate with these tools are necessary skills that enable us to quantify the world around us. They can tell us how tall we are, how hot we are, how much we drink, how heavy we are and how far it is from here to there. Today we were working on summarizing without adding our own opinions. In groups the 6th graders collaborated to create one sentence summaries of popular nursery rhymes. The debates and justifications were amazing to see in action. And the ground starts to shake. Not the Kinders, no way. They run to the gate. Math is always fun in Ms. Wojo's class. 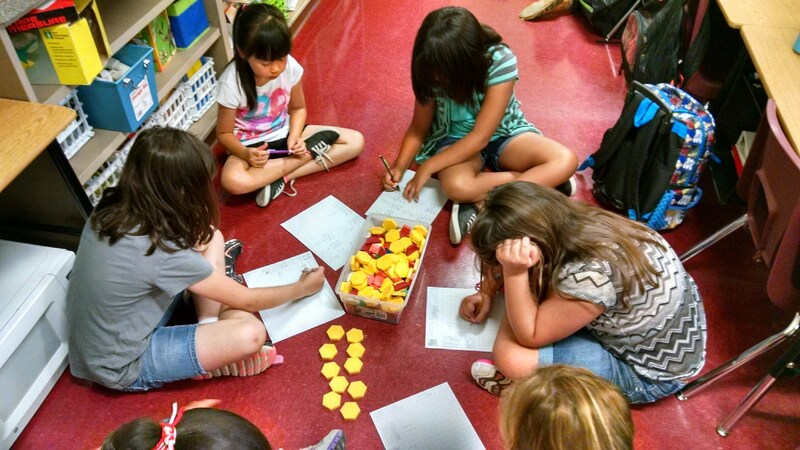 The students use various math manipulatives to get a concrete understanding of Math concepts. Rainy Day Schedule on Tuesday morning in Kindergarten! Kinders and first graders enjoyed social time on the carpet of with blocks and the computers. Seventh grade students prepare their thoughts by reading and responding to a text selection independently. Students then engage in a Socratic Seminar by sharing their thoughts, asking questions, and clarifying details of the text. My students have been learning about formulating testable hypothesis, designing experiment, conducting scientific investigations, identifying potential sources of errors and choosing the right graphs in presenting data and as well as communicating results and conclusion. On top of this, they learned how to solve problems using the Scientific Method. Please Click the link below. The girls softball team took on the Walker Butte Coyotes. McKenna Naylor started the game off, with her first time pitching this season, doing a great job. After a great start, Kayla Faust stepped up to pitch, landing her team 7 strike-outs. In the fourth inning, the team shook things up a bit, throwing catcher, Hayley Baker out to pitch and putting Kayla Faust in her place to catch. Hayley pitched her first strike-out this season. Maria Valenzuela closed things out in the fifth inning, and with the help of her fielders was able to hold the Coyotes to no runs in the 5th. Not only was the pitching amazing, but the Cheetahs' bats were hot! McKenna Naylor, Maria Valenzuela, and Kayla Faust all scored home runs, and Hayley Baker scored a season record 4 runs. Great back up in the outfield by all of the girls, aggressive base running, and solid hitting led the Cheetahs to a 20-11 win over the Coyotes. The Cheetahs lost 10 to 9 to Walker Butte on Thursday, despite scoring 9 runs on 10 hits. The “Hot Bat” belongs to Tucker Usher with 3 Hits, followed by Jake Morris and Gage Quigley with 2 hits each. Great defensive efforts by Adrian Parra, Bryson Schneider, Dalton Holley, and Jayden Matta. The only home run came from a 2 run blast over left center by Cameron Thomas. Welcome to Mrs. Stavely's Enrich/Reteach class! 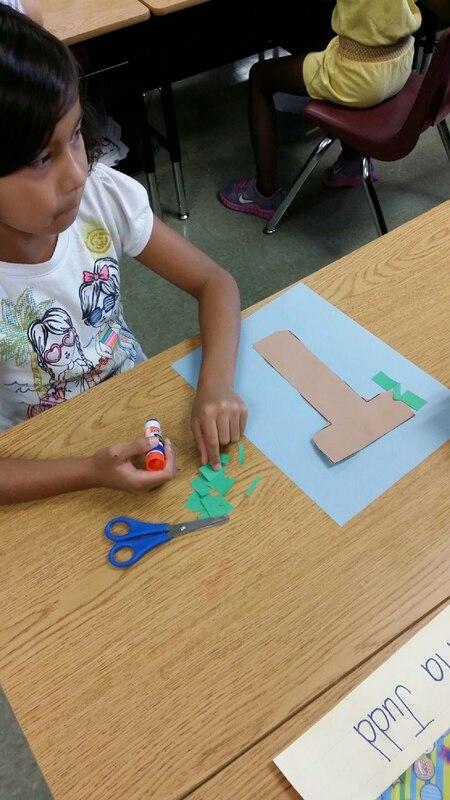 Here students are making arrays with base 10 blocks and various shapes. They got to make arrays with the shapes and draw them on their graph papers AND write the fact family to go with that array. Our 3rd graders are studying multiplication and division. Mrs. Dunning-Farmer's class works hard to improve their math skills during BUILD rotations. During "B", buddy games, students work on their fact fluency. In "U", students use manipulatives to practice the week's standard. "I", independent work, is time for Moby Max! During "L", learning numbers, students review previous math skills. In the "D" rotation, doing math, students do Mountain Math to practice, practice, practice. During BUILD, students are working with Mrs. Dunning-Farmer to challenge themselves and become stronger mathematicians. Students' Objective: Students will be able to develop skill in measuring with a graduated cylinder and use the metric system in measuring volume. Standard: I can perform measurements using appropriate scientific tools. FUN, SAFE, AND ENGAGED LEARNING! Mrs. Hoffman is often seen in the hallway walking with her kids. She uses an iPad that has different words popping up as flash cards. The kids are always practicing reading while they walk in the halls. The students in Mrs. Greenland's class analyzed stories to evaluate the elements of plot. The students were in partner groups to read the story and then created a plot diagram poster with evidence to justify their found elements. The partners will present their final product to the class. Circle Cross Cheetahs were back in black and ready to rock-n-roll for this year's back-to-school dance. 6th, 7th, and 8th graders were dressed the part with frizzy hair, bandannas and PLENTY of make-up to make the night one to remember. Practicing expanded notation in Mrs. Nieto's class is super fun with this game. You drop the paper clips on the expanded notation bulls-eye paper. You place the number it lands on in the chart. At the end, you write the whole number out in expanded notation form. Kinder students wrapped up the end of 'S' week by creating beautiful seahorses. Fifth graders in Mr. Bravo's class enjoy working out long-division problems using the Magic 7 strategy. Mr. Bravo has many large dry-erase boards placed around his classroom in order for small groups to work together to complete these problems. Great team work 5th graders! Captains Kaila and Kasey did a great job motivating the team to do their best during Thursday's game. Korey and Haley were amazingly aggressive catching for the team resulting in a lot of outs, with the help of basemen such as Maria, Kasey, and Adrianna. Left, center, and right field did excellent in backing up the bases. The score at the end was 14 to 2. Great job Cheetahs! The Cheetahs top Florence K-8 in a back and forth affair, 6-4. The Cheetahs and Florence K-8 exchanged the lead 5 times on Thursday, but HOT BATS and a great defensive effort proved too much for Florence to handle. Hits by Antonio Gallegos, Brysen Schneider, Dalton Holley, Jovani Varela, and finally a rocket to right field by Gage Quigley to take the lead in the top half of the 6th put the Cheetahs up for good 6 to 4. Antonio recorded the win for the Cheetahs. He allowed 4 runs over 5 innings. He struck out 8, walked 4 and surrendered 6 hits. He was backed up by great defensive play from Jake Morris, Cameron Thomas, Jovani Varela, and Dalton Holley. Today, Mrs. Dunning-Farmer’s 4th class learned about “I PICK” books by comparing their book selections to shoe selections. “I PICK” books are books that a reader selects for a Purpose, an Interest, for Comprehension, and Knowing the words. Students had lots of fun creating comparisons for the shoes they picked, their reason for doing so, and how this relates to reasons they may or may not pick a certain book. Here’s to a year of picking great books and becoming stronger readers! BT Standard: Using specific information, I can support the reasoning behind the analysis of text. Scientific question: Which one is safer or better to drink, tap water or bottled water? The pictures show students participating in a debate backed up with their CLAIM, EVIDENCE and REASONING as to whether or not they are tap water or bottled water drinkers. Ms. Bauder is now providing before school child care at Circle Cross Ranch. You can find more information and register your child in the office. Here are the early morning cheetahs playing balloon tennis. Our first ever Family Potluck dinner was a HUGE hit! Families and friends were invited to Circle Cross Ranch for a celebratory potluck dinner. We all rivaled in the glory of our A rating! CIRCLE CROSS RANCH IS AN A-RATED SCHOOL BY THE ARIZONA DEPARTMENT OF EDUCATION!!!! WOOT WOOT! The staff and students at Circle Cross got a lil crazy during a pep assembly after the announcement today! The teachers even did a little dance to congratulate the students on their success. Congrats to all Cheetahs for making CCR GRADE A! Follow us on Facebook to see more photos! In Mrs. Davis' class, they did a "getting to know you activity" using a beach ball. She wrote different questions on a beach ball and the students passed the ball around in a circle to music ( like hot potato). When the music stopped, the person with the beach ball had to pick a question to answer. The student would sit down after answering the question and the game would continue until all students had a chance to share. A fun way to get to know each other! First Week of School STEAM elective with Ms. Virtudes! STEAM elective ( Science, Technology, Engineering, Arts and Math). The challenge for today is to build a " Machine that will Pop a Balloon" . The students are in their initial stage of building the machine, they will finish it on Monday. The students each received a container of play-doh and created anything they wanted to. After creating their masterpieces they wrote a story about it in their writing journals and drew a picture. Fun and engaging learning! The students in Mr. Camarote's class loved learning about engineering in his class. The link below will take you to a cumulative video of Mr. Camarote's Robotic Engineering class from last year. The students taking the class this year have a lot of fun...we mean, learning to do this year! A poem by Michael Tyler "And like flowers in the fields, that make wonderful views, when we stand side-by-side in our wonderful hues...We all make a beauty so wonderfully true. We are special and different, and just the same, too!" To illustrate this poem, all fourth grade classes at Circle Cross Ranch made hand prints. The color of their hand prints match closely to the color of their skin. This is proof that while we are all special and different, put together, we make a beautiful view. We embrace diversity at Circle Cross Ranch. The students in Mrs. Moya's Kindergarten class work out their fine motor skills while making circles out of Play-Doh. Mrs. Moya always finds fun and engaging ways to learn! Good job Kinders! Here we see Mrs. Nieto's class gesturing the school rules during dismissal. As the students were waiting for the dismissal bell in the hallway, they practiced each rule. Good job, Cheetahs! Ms. Snyder's class practices the Power-Teaching rules everyday here at Circle Cross Ranch. CCR has implemented 5 school-wide rules. Each rule has a gesture assigned to it and students 'gesture out' the rules each morning. In 8th grade language arts, students were working on analyzing how internal factors contribute to mental and emotional health, which can hold students back in their academics. Students started by discussing what it means to have high self-esteem. We then talked about how negative comments can impact our self-esteem and self image. Students took a sheet of paper, cut it up into 4 equal parts, and wrote a mean comment or phrase that people say to bring down someone's self esteem. After we discussed the comments, 8 volunteers were asked to come to the front to demonstrate how those negative comments can affect you. Two pieces of tape were set on the floor about 12 feet apart. They were divided into two teams, and asked to stand in a single file behind the piece of tape. In the first round, one student was asked to walk from one piece of the tape to the other, then tag the next person so they could do the same. Once the last person crossed the piece of tape, their time was recorded. In the second round, they were given two negative comments that they had to drag with them. They could place it under their feet, under their hands, they just had to drag the two negative comments to the piece of tape and then back to tag the next person. Again their time was recorded when the last person crossed the last piece of tape. In the last round, they were given an additional two negative comments, so they ended up with 4 negative comments total. They had to drag all four pieces on the floor using a different limb for each one and try to get the best time. (The picture is of them trying to drag 4 pieces). In the end we discussed how the times changed, why each round got more difficult, and what could we take away from this activity. I got responses such as "Negative comments can slow you down from achieving your goals." "Instead of taking the negative comment with you, you should just throw it away so you can get to your destination quicker." "Cancel out a negative by telling yourself a positive". The students really seemed to grasp the idea that we shouldn't allow negative comments to drag us down. Plus they had fun watching their classmates struggle as they dragged themselves across the floor. Our 6th grade Language Arts class has started the school year off great! Each student in Mrs. Hull's class designed a popsicle stick that represented themselves as an individual. The popsicle sticks were then placed together to illustrate how everyone is unique but important in building our 6th grade family. Everyone is needed to make the group whole. The final product will hang in the classroom to remind the students year round. Awesome team-building 6th grade!